All of these groups are primarily composed of workers that CCWR has helped fight for better working conditions and for their jobs. Currently CCWR has about 14 Community Defenders who are able to lend their support to other workers and, along with the Executive Director. The Workers Council is the governing body within CCWR that makes the decisions about what projects to pursue with the community as well as the evaluation of the work CCWR does. This council is made up of 40 people who meet monthly, all of whom are workers that have been involved in different struggles that CCWR has helped to fight. The third governing body is the Board of Directors. This body helps with fundraising, meets every 3 months, and goes over CCWR’s policies. It is made up of 11 people, eight of whom are workers CCWR has worked with and three that come from outside the organization. According to CCWR’s structure there must always be one more worker than outside board member. The Executive Director, Martin Unzueta, plans activities and facilitates meetings with the collaboration of the Community Defenders and other volunteers. He also coordinates information from and collaboration with other organizations. He and the Community Defenders do weekly outreach on the radio around what Chicago Community and Workers’ Rights does as well as give some advice when people call in to ask about a labor issue. Martin Unzueta Executive Director of Chicago Community and Workers’ Rights works primarily with Latino immigrant workers in the Chicago land area, whether they are undocumented or documented. In the organization’s experience it is immigrant workers and workers of color who are at higher risks of exploitation due to their perceived lack of agency as individuals by their employers. Latino immigrant workers are particularly vulnerable because they might not know the labor laws in this country, since the labor laws are different than the ones they grew up knowing in their home countries. They may face barriers such as language, a lack of job and financial security, holding jobs that are not the safest, and a lack of or a perceived lack of legal status, which the employers try to take advantage of. Fernando Huerta is a founding member of Chicago Community and Workers’ Rights. 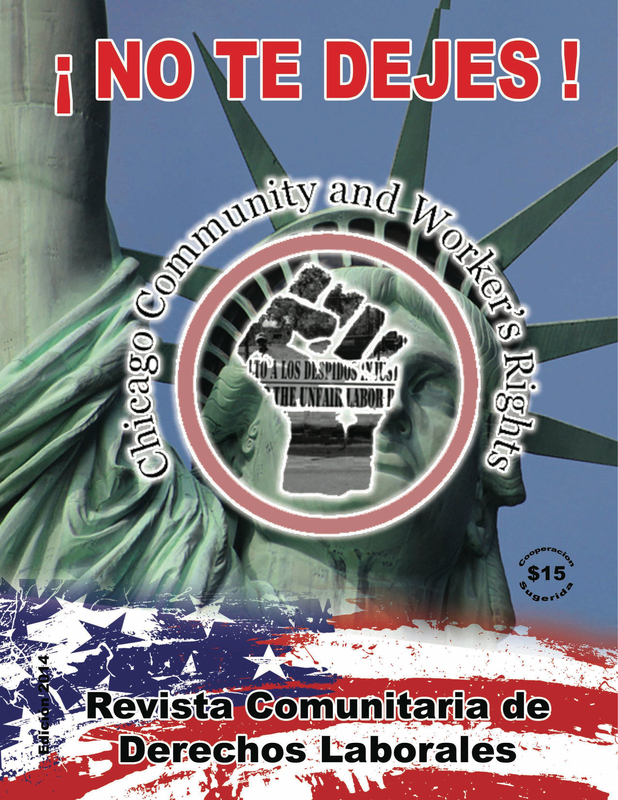 Huerta helped to develop the Community Defenders Training, as well as the formation of the cooperative Chicago Community and Workers Rights helped foster. Huerta has experience with working with cooperatives, stemming from his experience with working with a large urban transportation cooperative in Mexico. Currently Huerta volunteers with Chicago Community and Workers Rights. Gerardo Garcia came to Chicago Community and Workers’ Rights due to a wage theft claim and decided to stay on and volunteer for the organization. Garcia took a Community Defenders Training and has also given sessions to people currently in the program. Garcia is currently in the process of opening up his own restaurant. Abraham Uriel Ramirez is a 25 year old youth that emigrated from Mexico when he was seventeen years old; he studied in Radio arte in the Training in journalism, Radio Broadcasting and Media Art and came to Chicago Community and Workers’ Rights because he was interested in the struggle for worker’s rights. He is a volunteer helping with the Chicago Community and Workers’ Rights website and Social Media. Rosi Carrasco came to Chicago Community and Workers’ Rights in July as a volunteer and become involved with the committee that helped the organization to look for a new office space. She started helping to organize the Know Your Rights workshops in August and in November she started organizing these on a weekly basis. Carrasco has played key roles in immigrant rights mobilizations in Chicago and nationally, including the massive demonstrations in Chicago in 2006 and 2007. In the last years Carrasco has also taken an important role in supporting undocumented youth and parents of youth who decide to participate in civil disobedience as part of the strategy to stop deportations and now are a volunteer organizer with Undocumented Illinois/Organized Communities against Deportations.